How do you spend your Saturday mornings? We pack our van and head to market! 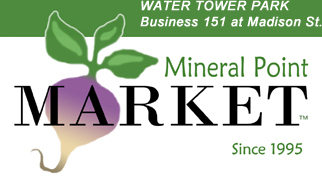 Since 1996, we've been selling certified organic vegetables to customers at the Mineral Point Market every Saturday May through October. We began Shooting Star Farm on rented land north of Dodgeville. After our first summer living in Mineral Point, we were convinced that we wanted to make this area our home. We soon located property and began building our farm — buildings and all — on land ten miles east of town. 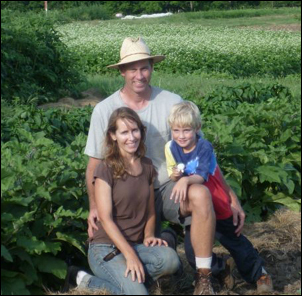 Over the years we've grown somewhat, but remain a small, diversified vegetable farm with a commitment to selling locally. Our crop specialties include salad greens and heirloom tomatoes, but you can find a wide array of items on our market table. You can also find our produce on the menus of restaurants in Mineral Point, Madison, Milwaukee, and Chicago. Come see us on Saturday morning!